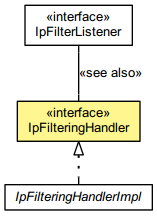 The Interface IpFilteringHandler. A Filter of IP. Users can add an IpFilterListener to add specific actions in case a connection is allowed or refused.